Verano de Escandalo is tonight at 6:30pm on Twitch. Psycho Clown is maybe off tonight’s Verano de Escandalo show. He missed Thursday’s show in Arena Aficion in what seemed like a strange angle because Psycho didn’t visibly look hurt. He also missed a show last night in Torreon, so he probably really is injured. Tonight’s show will probably be filled with surprises and changes anyway, so it might not be as simple as a single person sliding in to his spot. My preview of the show is still good. I think the show is going to be worth watching early on for casual fans since there’s a lot of guests they might know, and will be interesting for any one who follows lucha libre closer with the names expected to show up. Next news update is probably Monday afternoon. 4) Fishman Jr. b Canek Jr.
Fishman Jr. & Canek Jr. under slightly different names. Rey took 2/3 with Bestia and Ocelot getting involved. 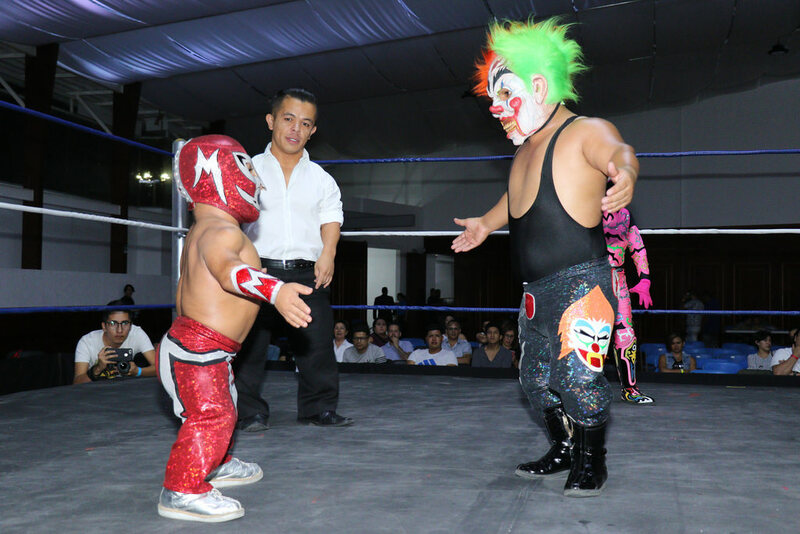 LA Park & Wagner working their match while one is headlining CMLL and the other headlining AAA is the current level of weirdness. Promos: Stuka & Guerrero Maya (looking ahead to ROH), Rush (blowing off Volador’s challenge; wants Volador stop looking like a girl.) It’d be weird to be building to two different singles matches with Rush in any promotion beside CMLL. Dragon Lee finished up the 2018 Best of Super Juniors with 3 wins, 4 losses, and one late arrival for the bus if Chase Owens slight dig was to be believed. He lost to Desperado on the final group day, but he was already out of it by then. It does suggest that if Hiromu Takahashi wins the tournament and the following championship match, Desperado is ahead in line to get a title shot than the CMLL luchador. Dragon Lee won 4 matches last year and seems no closer to being in the top mix after this tournament and it would take big movement to get him there even next year. His matches with Desperado, SHO and Takahashi are worth seeking out (maybe the KUSHIDA match too, haven’t heard much either way.) Dragon Lee also seems to be in relatively good health coming out of the tournament, though I still wouldn’t count out a break. Ultimo Guerrero did not get a shot at the ROH Championship on Saturday night. Dalton Castle has not been wrestling on some recent shows due to injury and he was held off from the NYC show as well. Ultimo Guerrero lost to Matt Taven instead. Titan took the loss to Cody in their match, with some cheating involved. Black Terry Jr. has photos from the Pura Raza show. Rayo de Jalisco is asked about his career, still hopes to have a mask/mask with Canek and Hijo del Solitario.